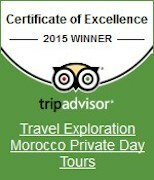 TripAdvisor has awarded Travel Exploration Morocco Private Day Tours the 2015 Certificate of Excellence. This achievement is a direct result of Travel Exploration’s consistent great reviews from Morocco travelers who have shared their experiences on TripAdvisor’s website. The Trip Advisor Certificate of Excellence Award is a testament to Travel Exploration’s High Standards and Service provided for couples, family, and small groups tours who have visited Morocco with Travel Exploration. The Trip Advisor award is given annually to exceptional travel agents and Morocco tour operators. TripAdvisor places a spotlight on businesses that are focused on delivering great service to customers. Travel Exploration specializes in private, hand curated tours to Morocco. With offices in, Marrakech and Ouarzazate, the company offers on the ground full services inclusive of private, luxury transportation, local guided site seeing tours, stays at luxury riads and options for the active travelers. The owner of Travel Exploration, Alecia Cohen, is a former magazine publisher, of Global Rhythm magazine and an executive who established Travel Exploration Morocco Private Tours with her Berber partner to show travelers the best of Morocco. Inspired by her passion for Morocco’s combination of natural wonders, Imperial cities, UNESCO World Heritage Sites, and Berber villages, she delights in organizing comprehensive and personally curated original travel itineraries for cultured and educated travelers. Mrs. Cohen has lectured at the World Bank on Culture & Sustainable Development in Africa and has been featured in various print and television venues, including CNN Financial News, Entrepreneurial Edge, Crain’s, Entrepreneur, and The World. With Travel Exploration Morocco Private Tours guests visit Arabo Andalous architectural sites in the Imperial Cities, majestic palaces, glorious houses of worship, opulent gardens and a breathtaking Sahara desert. You will taste Moroccan hospitality in Berber Villages and enjoy exquisite cuisine and elegant accommodations. Our team of expert, licensed Multi-lingual guides and drivers will set in motion a memorable journey. As a member of the American Association of Travel Agents, Travel Exploration takes pride in our impeccable service and reputation. The company also donates 5% of all proceeds to Berber Villages through our charity Project Feed.